After beating UCLA yesterday (who are now 0-5), the University of Washington Huskies are now 5-1 over all and 3-0 in conference. This puts them alone at the top of the Pac-12 North (more on that later). Going into last night's game, I was hoping for a blow-out. Something like a 48-3 victory. But UCLA wasn't having it and it was a hard-fought battle that ended with a score of 31-24. The Huskies led all of the game and had some brilliant plays. But the Bruins played better than their 0-5 record indicates. I was a bit worried the Huskies went in over-confident. And that may have happened. That and UCLA is improving, apparently. Next week UCLA plays Cal and that should be a close game. It was a fast game because UCLA didn't throw the ball much so the game clock kept running. It was also kind of a boring game because UCLA didn't throw the ball much. UW quarterback Jake Browning played well and Myles Gaskin did his usually 100+ yards performance. Salvon Ahmed, a sophomore, also played well. Next year he's going to have to take over the starting running back position from Gaskin. Next week we travel to Oregon to take on the Ducks. The Nike Quackers are coming off a bye so they will be well-rested. And we're playing on their territory in Eugene. That should be a tough game. It's at 12:30 PM PDT on ABC or ESPN 2. Check your local listings. There was one upset yesterday in the Pac-12. Unranked Utah beat #14 Stanford soundly with a score of 40-21. In Palo Alto! That's why the Huskies are now on top of the Pac-12 North. Stanford has a record of 4-2 overall and 2-1 in conference. That is the Utah Ute's first in-conference win. So, again, that puts the Huskies firmly on top of the Pac-12 North. 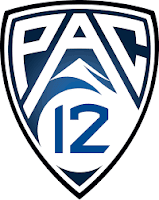 Gives us some breathing room if we want to be Pac-12 Champions. But not if we want to go to the College Football Playoffs (CFP). To do that we'll have to win every game from here on out. The only other 5-1 overall team is the Washington State Cougars who are 2-1 in conference so they are not a threat to Washington unless Washington loses an in-conference game. We are now six weeks through college football's 13-week regular season. Things are starting to firm up in the Pac-12. In the Pac-12 South, Colorado is still undefeated at 5-0 overall and 2-0 in conference. It's looking more and more as if the Pac-12 Championship game will be Washington and Colorado like it was in 2016. The Huskies also play Colorado in the regular season on October 20th. That should be a good game. There were three big upsets in the AP top 10. #5 LSU lost to #22 Florida. And #7 Oklahoma lost to #19 Texas. Finally, #8 Auburn lost to unranked Mississippi State. The only reason we care is because if LSU, Oklahoma, and Auburn drop out of the top ten, this could move #10 Washington up. The AP poll comes out at 2:00 PM each Sunday (except Labor Day weekend when it comes out on Tuesday. That's 11:00 AM PDT (my time zone). So I'm always waiting for it in order to finish this post. Washington moved up to #7 making them the highest ranked team with a loss (all the rest are 5-0 or 6-0). Stanford is no longer ranked (that surprises me). The Ducks moved up to #17. And the undefeated Colorado Buffaloes are up two to #19.